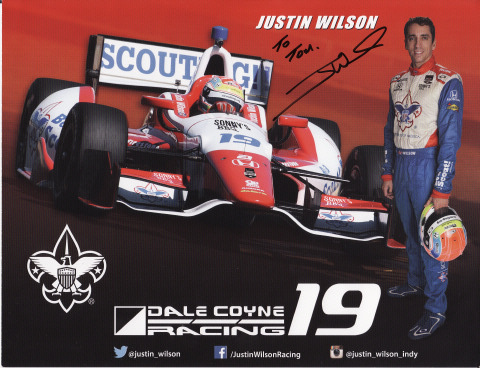 Cavin: Where will Justin Wilson end up? And while this trend isn't new, and will inevitably continue, nevertheless, it shouldn't have occurred to one of the sport's best known drivers, a multi-time winner, Balls-to-the-Walls 'Twisty Speed Merchant, total Fan favourite, safety leader and all around affable Good Guy! Yet as I mentioned in the story above, I actually was first introduced to JW' at Suzuka Circuito where he was partnering Mark 'Handlebarz Webber at Jaguar during the 2003 Japanese Grand Prix, ironically his final start in Formula 1; racing against the likes of then utterly dominant 'DER TERMINATOR's (M. Schumacher) fire breathing Scuderia Ferrari! As my funniest memory of Justin, who reportedly is still the tallest driver ever in F1, then at 6-feet 4-inches, with Jaguar team-mate Mark Webber, another "Six Footer," (6' 1") both dwarfed Scott "Scooter" Pruett whom they sandwiched between them during a publicity "Photo-shoot" for Ford's Jaguar. Pruett was then racing the XKR Bud Light sponsored Trans Am car for Paul "Goofy" Gentilozzi's Rocketsports Racing team, with Pruett rocketing to the TA title by obliterating the field with eight of eleven wins en route to his third Trans Am crown! As Justin was then a two-time winner and most definitely a Rising Star in CCWS, whom for Mwah was a refreshing alternative to le 'Hamburgular, nee Sebastain Bourdais. Especially since Justin never MOPED! Like SeaBass did, nor did Wilson ever throw anybody underneath the proverbial Bus. Hence, of the few times I can count on one hand. When Justin was "Hot" underneath the collar, the driver in Question most appropriately deserved Justin's ire! "God Help Us if Justin ever gets a competitive ride!" As Justin never truly got the break he deserved, but it never disparaged him publicly, having driven for a "Who's Who" of racing teams, typically ones with lesser budgets vs. Open Wheel's Stall harts Penske and Ganassi, the latter of whom I still bristle at, as Wilson got harangued for bringing in Cheeps' then leading Daytona Prototype when Wilson heard something go Bang! And ultimately finished runner-up, in what I always wonder if it was an audition for an IndyCar seat? Thus, surely it was even sweeter winning the Rolex 24 for Michael Shank Racing alongside his good friend, ex-RuSport team-mate and co-driver A.J. Allmendinger for the 50th running no less! As Justin won for RuSport, Newman Haas Lanigan Racing and Dale Coyne Racing, before sadly perishing just weeks after his 37th birthday driving for Andretti Autosport in what can only be described as a Freakish accident! For which understandably, his wife Julia went away for this year's Pocono 500 IndyCar race weekend to grieve privately over the loss of her husband and father of their two girls. And although I couldn't see them, I was happy to hear Simon, one of the Hosers' accompanying me this May at Mother Speedway, that he'd seen tons of people wearing the exact same BAD ARSE' WILSON! T-Shirt I was wearing that day in my own 'lil tribute to this great person! As Thanks for the memories Justin! Another Shot for the "Russian Rocket!" May be I shoulda used the Backup Camera?